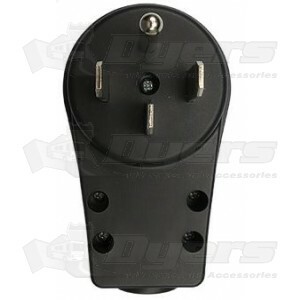 This Male RV connector is used to replace worn out molded female ends on adapters, surge protectors and extension cords; saving you from to replace the whole product! Made of high heat, impact-resistant plastic and heavy-duty highly conductive metal contacts. Thus making the replacement better suited to handle the heat created by heavy loads as opposed to molded-on varieties. Sleek, compact design makes installation straightforward and easy. Made out of a high impact Valox plastic. Installation is straight forward and easy. 50 amp model can accommodate either 8/4 or 6/4 S type cable. 240V / 50A / 12,000W.